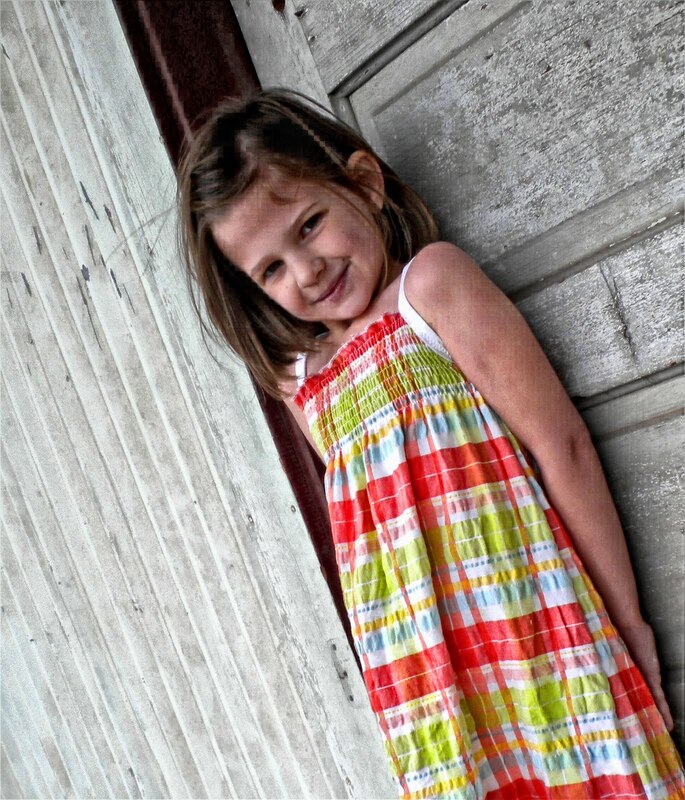 I always seem to have a hard time finding dresses that are long enough for my skinny legged girlies. So, I thought I would turn the Sweet Dress into a maxi dress. Finish the top of the neckline on each side with a rolled hem edge. Time to shir. Wind your bobbin with elastic thread, stretching about 50% as you go. Thread your machine with normal thread on top. The easiest way to make sure you make straight lines across your dress is by using plaid or striped fabric, like me! ;0) If you want to be exact, you may want to mark your lines with a dress makers pencil. Start about 3/4 of an inch below the top of the dress. The next stitching line should be about 1/2 inch below the first. Continue down until you have about 3 lines under the bottom of the armhole. Sew the side seams together. 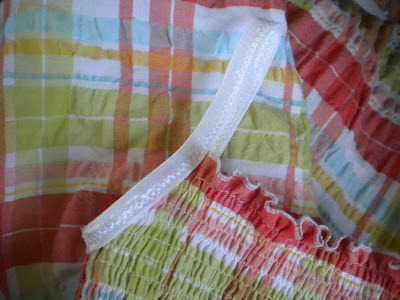 Sew your ruffle strips together then hem one edge. Gather the other edge and attach to the bottom of your dress. Cut your FOE into two strips that measure about 11 inches. (You can also use bias tape.) It might be best to measure your child or one of your child's garments from underarm seam along the sleeve seam to the top of the shoulder. Multiply by two but don't add a seam allowance, as the stretch of the FOE makes up for that. 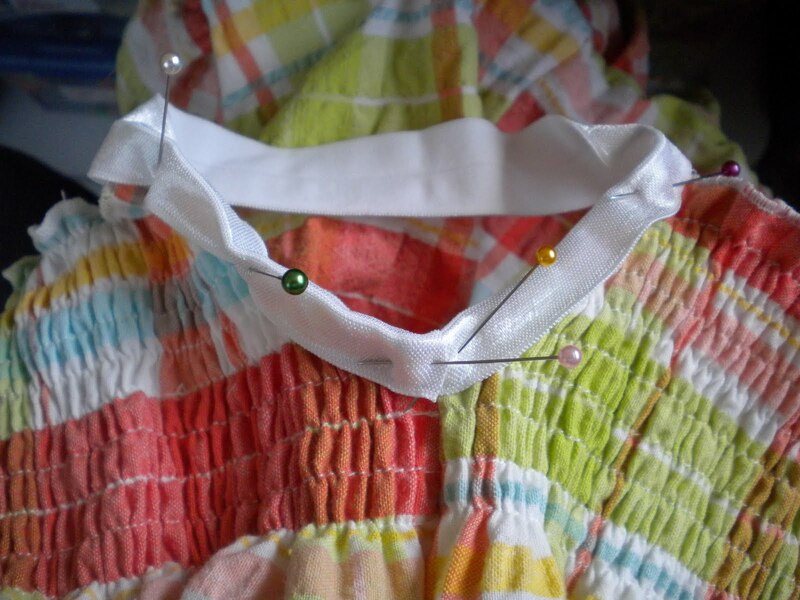 Start at the underarm seam and pin the FOE into place, overlapping the end just a hair. Stitch into place using a wide and long zigzag stitch. 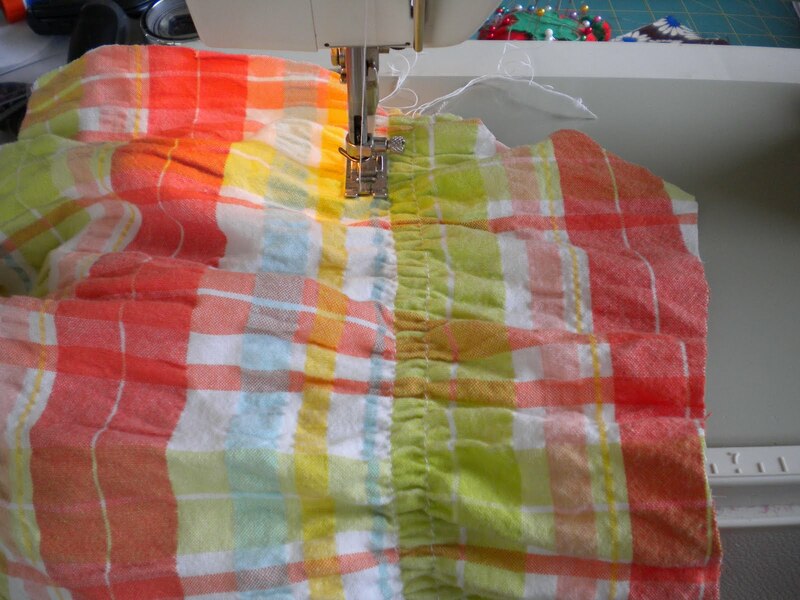 Stitch into place using a wide and long zigzag stitch. Oh so adorable, I'm in love with these. Are you taking these pictures? I love this maxi dress! This is so cute I'm thinking of making one for myself. I have honestly never thought of using a plaid or striped fabric for shirring in order to not have to mark any lines. Genius! Very sophistocated and retro too! Thanks for the tut! I've wanted to know how to do a shirred dress with these kind of sleeves. I'm trying to figure out how many cute little girls you have and I'm thinking it's 4. Am I right? My word they are adorable. Clever! And great colors in that fabric. I have been meaning to try using FOE but just haven't yet. This looks so cute! Sheesh you are amazing with what you can make from even just one pattern!! Super cute!! She is gorgeous too! So cute. 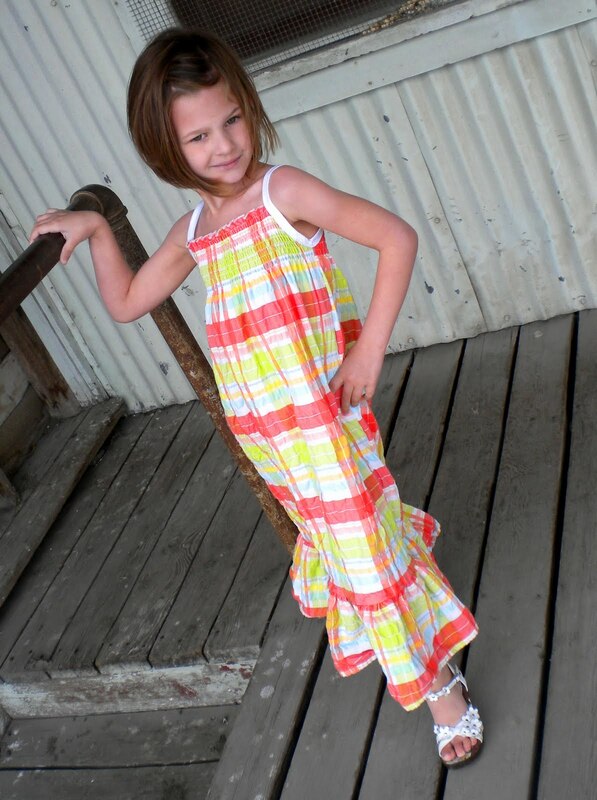 Such a great combination of fabric, pattern and a cute little model! what a difference from yesterday's dress!